This week marks the halfway point in our episodes on the types of NUDGES. We have already covered incentives and understanding mapping. Today, is all about defaults within choice architecture. When you think about choice and defaults, you may think it only applies when there is a preselected option on a list, but this is not the case. In every choice there is always a default. In many cases, the default is to do nothing…and that is still a choice, which is important for many choice architects to remember. I won’t be talking too much about what a default is, but I will talk about how what I’m calling “implied defaults” can be incredibly helpful when they are used strategically. I’ll also talk about how customers appreciate them and how they can benefit the company using them. 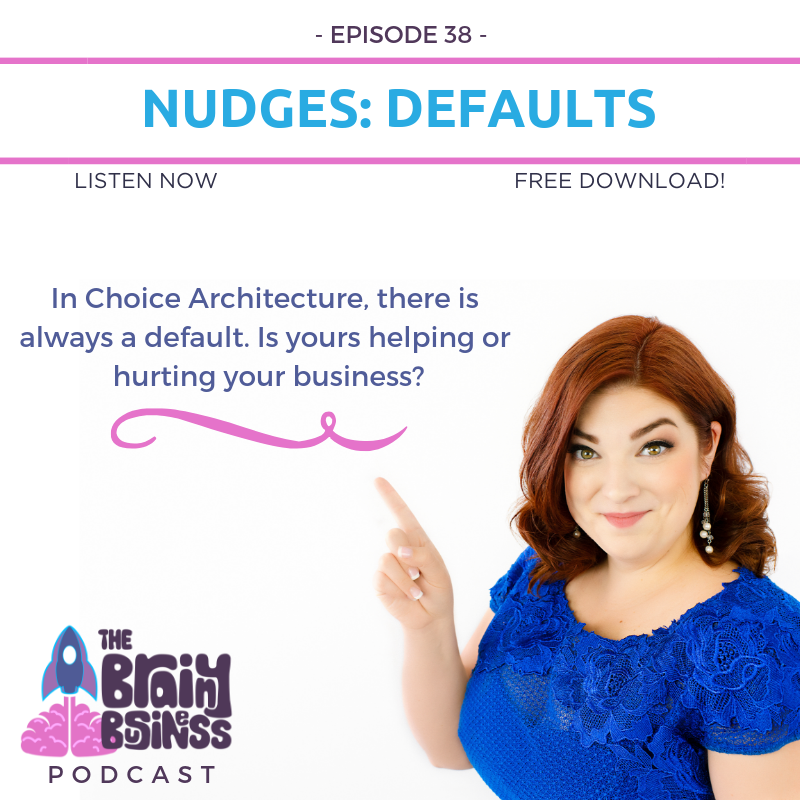 In this behavioral economics podcast, I also go over how defaults can apply to the air conditioning example I have been using and how this concept can be applied to your company or service and how it can even help you save money. [03:03] In every choice there is always a default. In many cases, the default is to do nothing…and that is still a choice, which is important for many choice architects to remember. 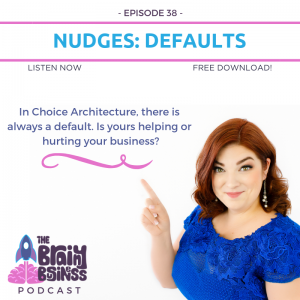 [03:32] When you are constructing a choice for someone, it is important to remember what their default is and how status quo bias will influence the default. [04:19] Air conditioning example. The default is to do nothing. [05:09] The company should make it easier for their customer to overcome this default hurdle. [07:34] The unit size we need is based on things that are already known…but they choose not to mention any numbers at all until you are deep into the process. [07:43] This is a mistake because first, there is no anchor. When there isn’t an anchor the anchor is zero. This is a terrible place to start. [08:12] Sticker shock is created when people actually hear the cost. [09:24] When thinking about defaults in choices, it is important to realize that each complete choice can be broken down into a bunch of mini choices, and each one has its own default. [09:58] When the choice is presented, it can be properly worded to help nudge to a different default than nothing. [10:50] The default when quoting pricing for AC could and should be for the monthly payment of a loan instead of the bulk cost. [12:05] I give an example of where I move the default option in the offer from “not getting air conditioning” (the true default) to getting AC on a 24 month loan (the implied default). This is the power of framing. [13:09] How does a company choose and understand what they should use as their default? [13:28] Understanding incentives and how they impact the business is very important when choosing a default. [18:28] Printing receipts is an example where defaults can cost a business money. [19:52] The city of Tulsa, Oklahoma reportedly switched all their printers to default to double-sided printing, which they estimated saved them more than $41,000 a year in unnecessary expense. [20:39] Our default as humans is often to eat food in front of us and mindless eating can be a problem. If the default plate is smaller, you will put less on the plate and often realize you are full earlier. [21:51] Not defaulting to adding straws and napkins to orders can reduce waste. [22:24] An Amazon subscription example, which used a default. [26:01] Think about your business. Do you have a product or service that people buy regularly? [26:38] An opt in versus opt out can have a huge impact on choice. [28:05] Where do you have opt ins versus opt outs in your business? Are there any features people have to opt in for that would actually be best for them and increase your profitability? [30:13] Think about what your customers want and what will benefit them and what’s going to benefit the business before you set up that default. [31:03] GAP insurance is usually an add on which is a hard sell. The advice I would give is to bundle it with the initial quote and clients can opt out if they want. [33:46] Defaults are a powerful and very simple nudge to apply. When used responsibly, defaults are great and often appreciated by customers. [36:27] Implied defaults can be incredibly helpful when they are used strategically. Customers appreciate them and they can benefit the company using them.